Vachel Lindsay — poet, idealist, troubador — is sometimes called Springfield’s “second most famous” son. He was born in Springfield in 1879 and always considered the Capitol City his home. Like any youngster growing up in Central Illinois, Lindsay was schooled in the virtues of Abraham Lincoln, Springfield’s most famous resident. He, like Lincoln, was fascinated by the common people, and much of his poetry reflected that fascination. 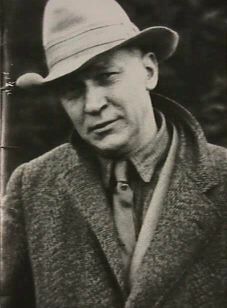 Young Lindsay, whose full name was Nicholas Vachel Lindsay, attended Hiram College in Hiram, Ohio, for three years before studying art in Chicago and New York City. He later turned to poetry, a medium which was more successful for him. He first received recognition in 1913, when “Poetry” magazine published his poem “General William Booth Enters into Heaven” about the founder of The Salvation Army. Racial harmony was a concern of Lindsay’s. “The Congo,” a poem about blacks, was one of his most famous and popular poems. Lindsay spent much of his life walking across the country, performing and distributing copies of his poetry in exchange for bed and board. Lindsay’s poems were very rhythmic, and he performed them almost melodramatically — chanting, shouting, gesturing, and even singing rather than merely reciting. Lindsay married Elizabeth Connor in 1925 when he was 45 and she was 23. They had two children, Susan in 1926 and Nicholas in 1927. They settled in Vachel’s family home in Springfield in 1929. The poet’s career declined during the 1920s. He began to believe that people were only impressed with his powerful performances, not the poetry itself. Lindsay became severely depressed as both his creativity and his popularity waned; he committed suicide in 1931 by drinking poison. Do you have any comments, criticism, paraphrasis or analysis of this poem that you feel would assist other visitors in understanding the meaning or the theme of this poem by Vachel Lindsay better? If accepted, your analysis will be added to this page of American Poems. Together we can build a wealth of information, but it will take some discipline and determination.